Patricio Ruiz, Guitar and Vocals, (Guitarra y Voz) Diego Salcedo, Guitar, percussion and Keyboards (Guitarra, percusión y teclados) Eugenio Fontana, Bass and Vocals (Bajo y Voz), and Brian Topham, drums (Bateria), are the men that create the beast of sounds, known as The Deep Sea Monster. Hailing from Lima, Peru, singing in English and Spanish, the quartet immerses psychedelic rock, influential sounds of the 70s, into a revived garage rock sound. 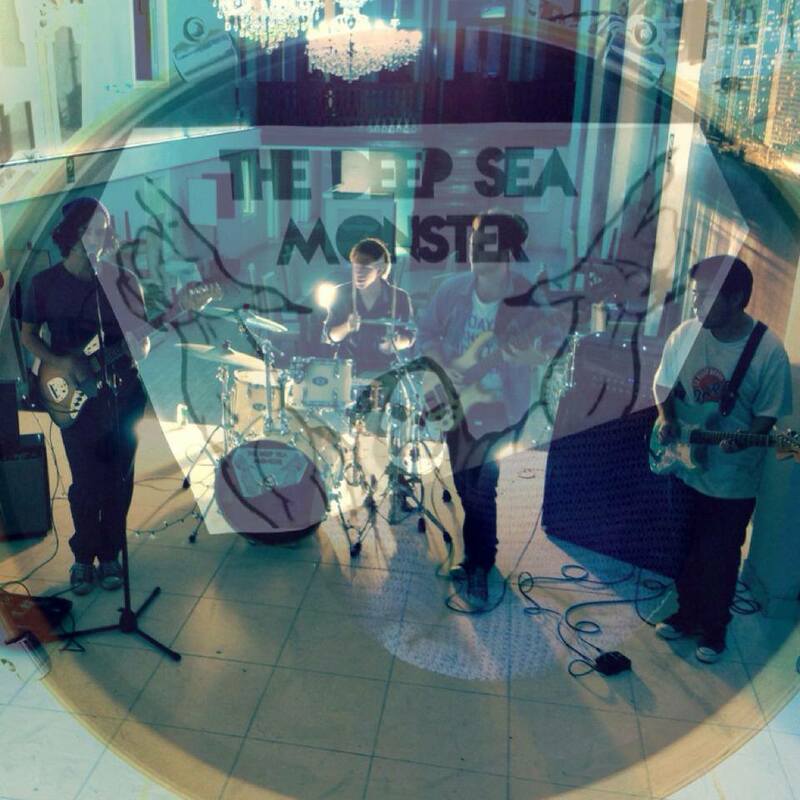 Their new, self-titled album, The Deep Sea Monster (2015), released in January, is a 9 track compilation of psychedelic garage rock that will not disappoint. Various tracks hold unique features that will allow each track to be fresh, while not straying too far from their original sound. The opening track, “Chucarapi,” is an instrumental 3 minute song that warms up the tone for the album, revolving around catchy guitar riffs being layered, and simple, strong drumming that holds the guitars together. The original song that caught my attention is the second track off the album, “Did You Hide From The Sun?” The bass is a notable feature that must be heard and admired on this track. Sounding like an English Rock Band, with the help of a mod style vocal approach, the track is an immediate ear pleaser, as it slowly rises to a soft, modernized psychedelic tune. Progressing deeper into the album, more psychedelic and 70s inspired sounds are heard, such as the next track, “Aturdido.” Translated into English, meaning, “in a daze,” the track holds on to the audible definition, and is the first Spanish track from the album. Every instrument can be admired in isolation and in unity, especially the keyboards, that truly bring the nostalgic psych feel to the track. “On the Run,” once again starts off with an amazing bass line and drumming that work in sync with the rough, garage style vocals. The high-pitched background vocals, also add a well-balanced touch, softening any rough edges on this track. “River Interlude” is the chorus within the whole album, and an appreciated breath of fresh air, acting as a unique, and clever pause within the album. For almost 2 minutes, soft fluidity runs, in addition to Peruvian immersed sounds of the acoustic guitar, and soft percussion beats on blocks. Sometimes interludes can distract, or be messy within an album, but the placement and construction of this interlude, is another part of the a story on the album that is built up for the second half; nothing less than genius. While still being in a tranquil state of mind, the album makes a smooth transition to the next track, “Like A God.” Slower tempo, and blissful sounds, almost as a harder ambience, lull with a beautiful harmony between vocals. By the third minute, there is a harder crunch, that builds for a dramatic purpose, between guitar distortions and drums. “Conspiracy,” continues the philosophical story that “Like A God” exhibited, while being heavier in distorted vocals and heavy synths. From the point of the interlude, all songs coexist, especially the last three, to continue the voice being heard. “Around Here” slowly goes back to the garage rock sounds, at a slower tempo. A great appreciation for the craft of The Deep Sea Monster’s ability of constructing an album; each track is well-placed and the transitions between song not only bring out each individual track, the album as a whole art. “All of Eternia” is the track that proves the well placement, and completes the album from the start of the instrumental, to the interlude, and the flow between sounds. Dripping in a swirl of samples, synths, guitar distortions,and steady drumming, this outro is stabilized, and wraps up the theme of experimentation on the album. All though the album contains a vast amount of different sounds, it is the placement and design of each track that holds it together.